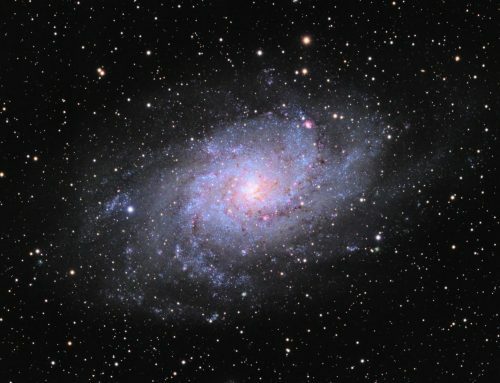 M33, the Triangulum Galaxy, is one of the closest large galaxies to Earth. It’s visible to the naked eye in a dark sky, and is a fine sight in a large telescope. It lies in the constellation Triangulum around 2.5 million light years distant and has a diameter of around 60,000 light years. 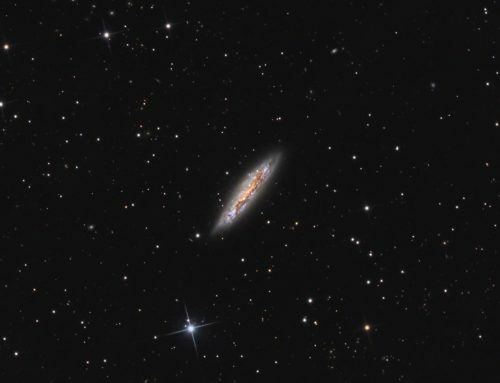 Because of its size and relative closeness to us, this galaxy displays a wealth of detail in photographs. 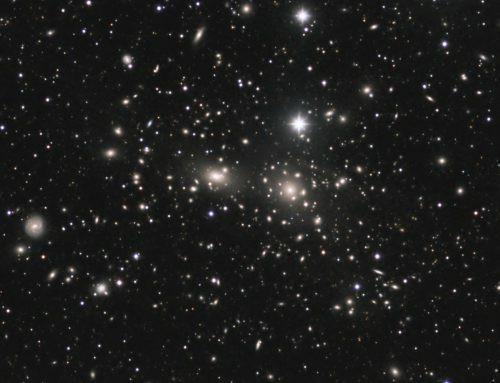 Even through the eyepiece some of the brighter knots of star clusters and glowing nebulae stand out enough that they were given separate catalogue numbers. In making this image a hydrogen alpha filter was used to capture the deep red light emitted by nebulae in M33. These structures are similar to our Milky Way’s Orion Nebula. 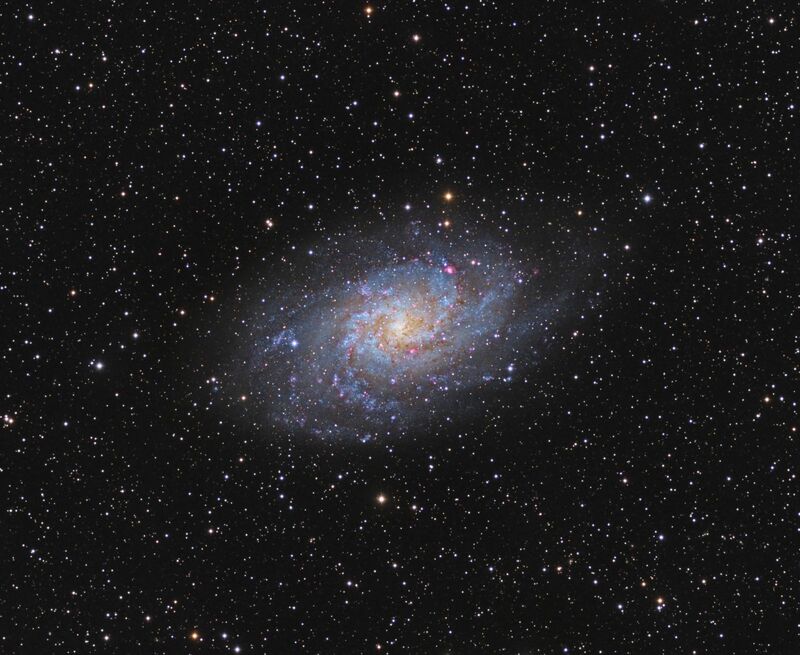 The image also highlights the star-rich core of M33, encircled by dark dust lanes. 20x10m R, 18x10m G, 19x10m B and 8x10m Ha unbinned frames (total=10hr50m). Creation and cleanup: The BatchPreProcessing script was used to perform calibration, cosmetic correction and registration of all frames. ImageIntegration and DrizzleIntegration were used to make the Ha, R, G and B masters. The masters were cropped and processed with DBE. ChannelCombination was used to make RGB image which BackgroundNeutralization and ColorCalibration. Combining Ha and RGB data: The NBRGBCombination script was run with default settings using Ha for red A stretched and blurred copy of the Ha master was used as a mask to blend the resulting image into the RGB image. using PixelMath. Linear Noise Reduction: MultiscaleLinearTransform was used to reduce noise in the HaRGB image. Layer settings for threshold and strength: Layer 1: 3.0 0.8 Layer 2: 2.5, 0.7 Layer 3: 2., 0.6 Layer 4: 1.0, 0.2 Layer 5: 0.5, 0.1. 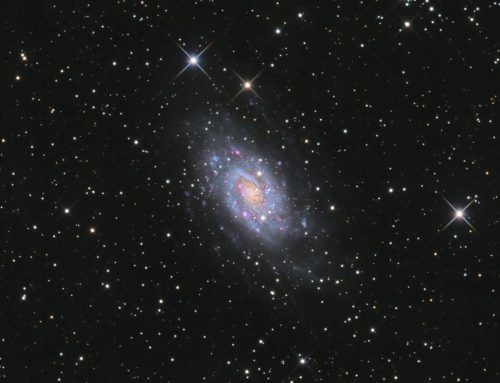 Stretching: ArcSinhStretch was used to begin the stretch, until just the core of M33 was visible, with the goal of helping to preserve star colours. HistogramTransformation was applied to the HaRGB image to make a pleasing, bright image. Creation and cleanup of SynthL: The four channel masters were integrated (average, noise weighted, no rejection) using ImageIntegration to create the SynthL. Linear Noise Reduction: MultiscaleLinearTransform was used to reduce noise in the background areas of the HaRGB file. Layer settings for threshold and strength: Layer 1: 3.0 0.7 Layer 2: 2.0, 0.5 Layer 3: 1.0, 0.4 Layer 4: 0.5, 0.2. Local Contrast Adjustment: The LocalFuzzyHistogramHyperbolization script was applied in Linear mode using the low end of the range of recommended settings and 10×10 scale. The result was blended with the original 50:50. Bright areas of the galaxy were processed HDRMultiscaleTransformation (6 layers, max contrast 1.5, strength 0.3) followed by LocalHistrogramEqualization (max contrast 1.5, scale 64, strength 0.65) using a mask for both processes to protect background and stars. The processed SynthL was applied to the HaRGB image using LRGBCombine.